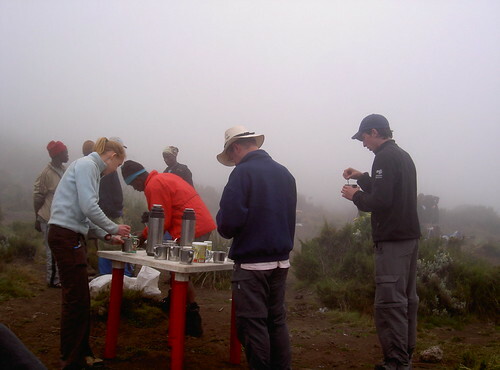 Notes and photos from my Kilimanjaro diaries written in 2007. Uploaded to my blog in 2009 but posted with a 2007 publish date. Eerie walk over the Saddle, and afro-alpine desert of screen with little gradient and just a few patches of moss and small flowers near rocks. 200 metres or so to our right, the Saddle dropped off and a vertical wall of cloud obscured the view. 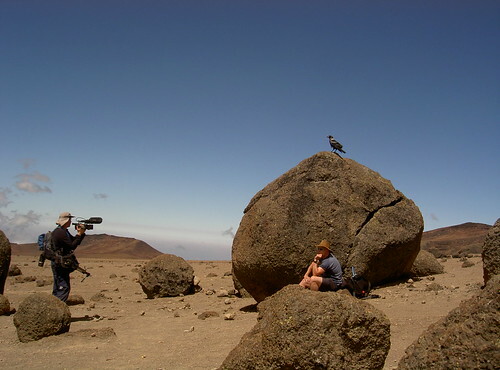 Packed lunch at a collection of boulders that also seemed to be the base for some very nasty looking crows that must have known we would stop there for lunch. 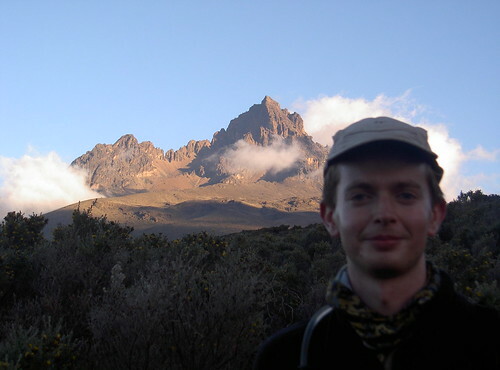 Exhausting final push to Kibo Hut, arriving about 4:30pm, for an early dinner before settling down for some sleep before waking up at 11pm to get ready for our midnight departure for the summit. 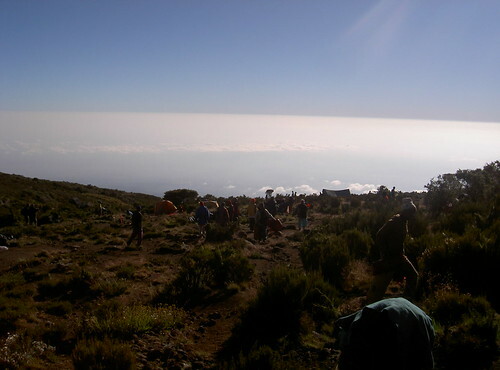 Pretty cold when waking up, but glorious sunshine sets an amazing scene over the clouds covering the world below. 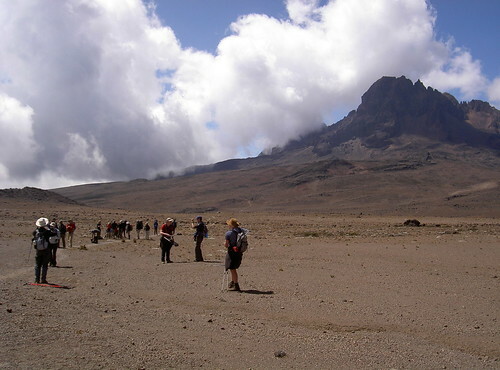 Start walk to Mawenzi Tarn Hut in time for lunch. 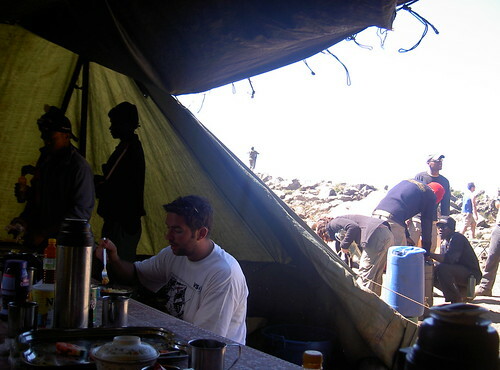 Lunch had an Arabian feel as we ate in the food tent: sun and shadows danced across the wind-knocked canvas. 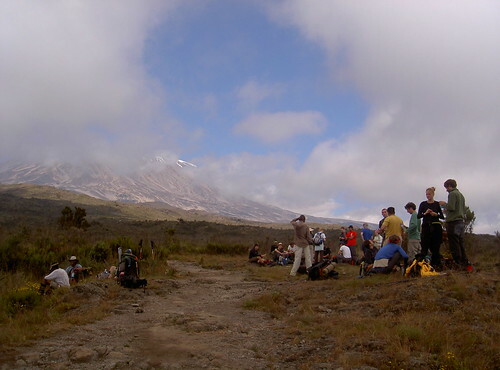 The camp itself was inside a small crater with a shallow pond at the foot of Mawenzi Peak. 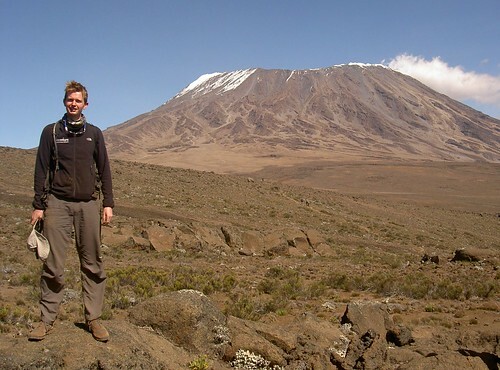 After lunch, we headed off on an “acclimatisation walk”. 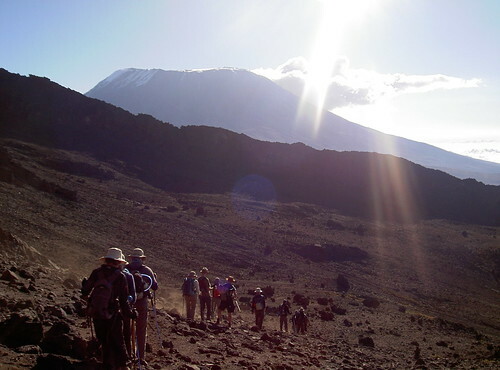 One of our party wasn’t able to make it due to his delicate diarrhoea situation but the rest of us got an idea of the style of hiking we would have to perform on summit night (relentless zig-zagging across steep slopes). 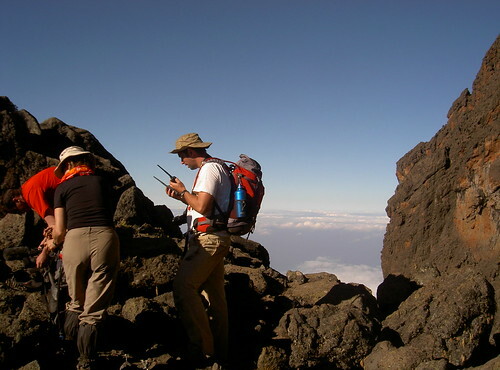 We did this for about 90 minutes (summit night would be for 6 hours) and ended up half-way up Mawenzi Peak on a rocky outcrop … stunning views over the edge. 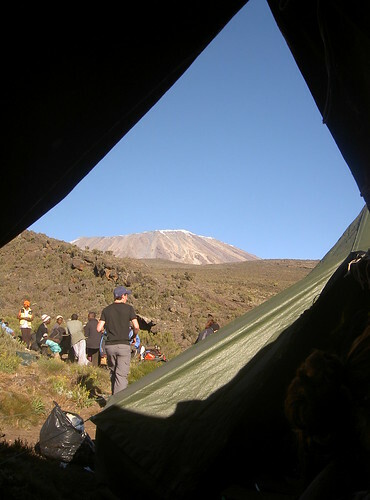 Looking the other way, we could also see the true summit of Kilimanjaro – Kibo Peak – and not much higher than where we were, the shining roof of Kibo Hut where we would arrive tomorrow afternoon for our summit attempt the next day. Coming down was great fun and for once I was grateful of having my walking poles which really helped with stability and speed. Very pleased with the wrist straps that came with the poles too, as they made it very easy to flick the poles out ahead of my feet. 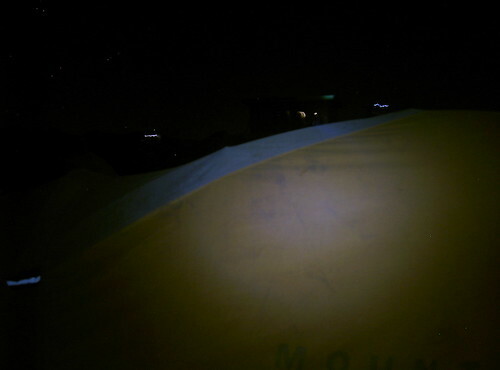 Slept in boxers with no sleeping bag liner to test I wouldn’t be too cold. 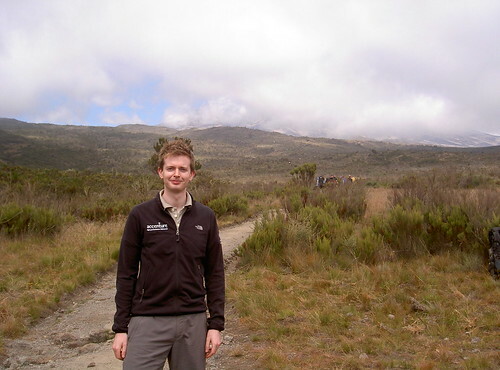 Woke up mildly chilly but was reassured that I still had several more layers of clothing to wrap up in as we ascended the volcano. The daily routine that I would get used to involved a 6:30am wake-up with tea in bed. Breakfast from 7am (porridge and jam) with the aim of having everything packed up and ready to go by 8am. 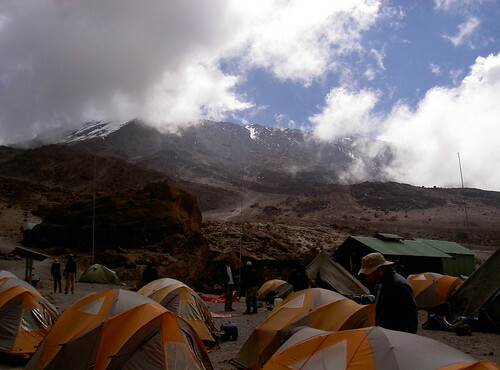 As I left my tent to get breakfast, I could still see Kili from the camp, but by the time we left at 8am, the clouds had rolled in again. 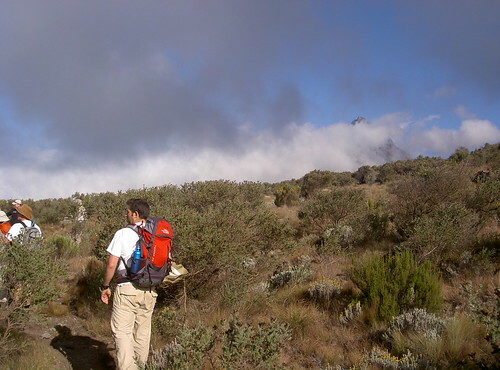 We set off from our campsite and as we progressed the thick bushes became shorter and shorter until we realised the lack of vegetation from hereon would mean there was no privacy for loo breaks. 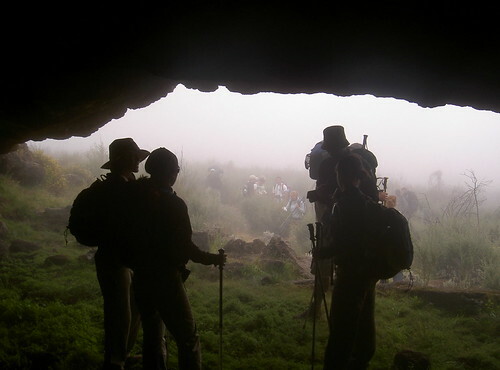 The milestone of breaking through the cloud line seemed to continue to evade us all morning, but around lunchtime we entered the thick cloud and had lunch in the fog near a cave. 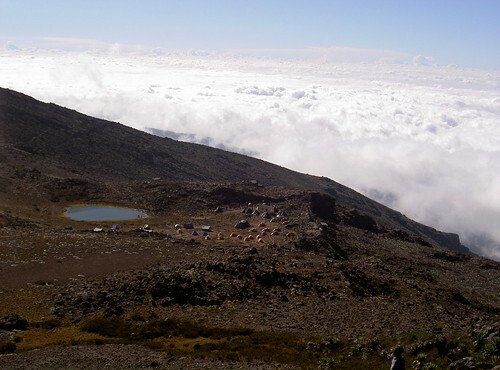 Several hours later we emerged from the cloud into strong sunshine and uninterrupted views of Kibo Peak for once. 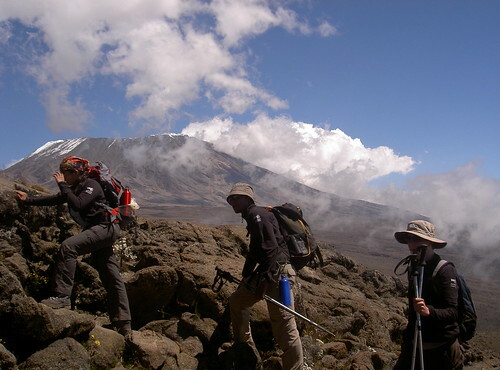 Progression seemed odd from here, as we were not walking towards Kibo, but instead towards her sister Mawenzi Peak for a day of acclimatization. 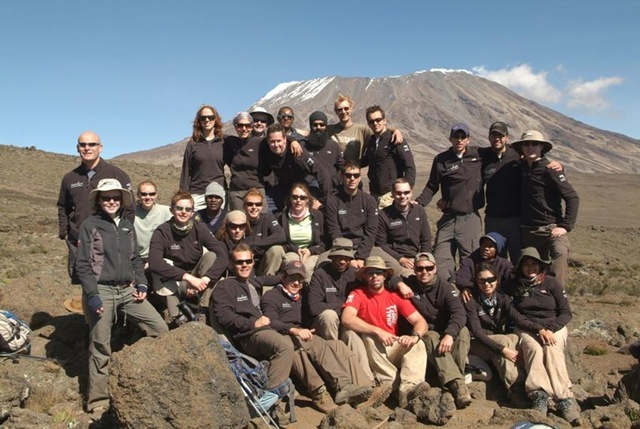 The two peaks are very difference in appearance: Kibo appears almost flat on top, while Mawenzi is sharp and jagged. Washed feet at camp. As the sun set it got cold very quickly. People were tired so there was no will to play card games like last night. Straight to bed.